In his thoughtful article in the latest issue of McKinsey Quarterly, my former work colleague Pankaj Ghemawat encourages senior business executives to shake up their thinking by adopting a more global perspective on their businesses. Ghemawat suggests that leaders can “enhance their intuition about the opportunities and threats inherent in our semiglobalized world” by using “rooted maps”—an example of which is provided below. This global map of the U.S. film industry sizes each country according to its contribution to 2009 U.S. box office revenues, and colors it based on the market share captured by U.S.-made films. Those countries colored light blue are the ones where U.S. films capture 85 percent or more of the national box office. The map provides a quick visual reference as to where America’s business currently is, and the strength of local competitors. If we updated the figures in this map to reflect 2011 box office results, two noticeable changes would occur: the U.S. map would shrink slightly, and the map for China would double in size to reflect its rapid recent market expansion. But if we adjust for the amount of money that actually flows back to the U.S. from China—net of the exorbitant distribution fees China’s monopolistic import structure charges—its map would shrink back down to about the size of Venezuela. China should thus be a top priority for Hollywood’s executives for two reasons: 1) China’s share of the global market will continue to expand and before long will overtake that of the U.S.; and 2) If they intend to participate meaningfully in the movie industry’s future growth, Hollywood’s leaders will need to find ways to repatriate a larger share of China’s domestic revenue. An analagous map for China reveals a very different situation than the one for the U.S. So little of the Chinese film industry’s box office comes from outside the country that other territories appear as mere specks on China’s world map. Of course, China’s film industry leaders would like to paint a very different picture in the future. The Communist Party is investing mightily to expand the country’s cultural exports in the effort to extend its ‘soft power’ around the globe. As China’s domestic business grows, and as the infrastructure and skill base to support it improve, China’s ability to compete internationally should theoretically grow too. But China’s internal capabilities are still limited, so it will need outside help to reach its global market share goals. Severe shortages of experienced, commercially capable screenwriters, directors, producers, and other talent mean that few films made in China without foreign partners are able to attract international attention. Only two places can truly offer the sort of help that China needs: Hong Kong and Hollywood. The degree to which Hollywood benefits from China’s future growth will depend, in large part, on decisions that Hollywood’s executives make now and in the very near future, and whether or not they take a cue from their Hong Kong brethren. Hong Kong is extremely well positioned to support and benefit from the Chinese film market. With its cultural, linguistic, and geographic proximity, and its established talent base, Hong Kong is already a major partner for China’s production industry. Hong Kong’s producers offer a crucial understanding and skill set that China’s producers lack: how to make films that appeal to international audiences (not to mention domestic Chinese audiences). Very few Chinese films ever achieve distribution outside China, and those that do tend to fall flat. 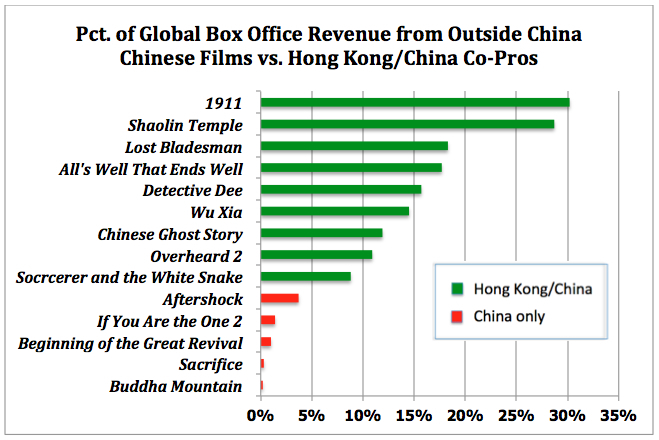 As the chart below illustrates, Hong Kong/China co-productions perform far better internationally than do purely Chinese films. America also clearly has a great deal to offer China, far more than Hong Kong can. Hollywood’s movie development, production and distribution system has dominated the global market for a century. But as China’s capabilities develop—and they most certainly will, with or without Hollywood’s help—China will become an increasingly potent global competitor. Hong Kong’s producers have already entrenched themselves in the Chinese system; some 70 percent of China’s co-productions in recent years were made with Hong Kong partners. The question now is whether Hollywood will do the same. During the past few years, Chinese producers and financiers have demonstrated a strong appetite for hiring and working with U.S. talent. The degree to which U.S. players get to participate in the Chinese system will be largely up to them. Those that seize the chance and recalibrate their skills to work together with Chinese partners will open up an entirely new world of opportunity for themselves. This entry was posted in Analysis, Opinion and tagged China's film industry, China-Hong Kong co-productions, global film business, Hong Kong film producers, McKinsey Quarterly, Pankaj Ghemawat, Rob Cain, Robert Cain by chinafilmbiz. Bookmark the permalink. Do you think that the trend of hiring foreign talent will truly hold? Especially for those us who just beginning our careers in the movie industry? I have certainly seen this “appetite” to be true in the now. For example I recently watched a Chinese movie called “Starry, Starry Night” whose Cinematographer Jack Pollock fits into your category quite nicely. However, I wonder if this appetite only relates to an already established generation who the Chinese can learn from and doesn’t necessarily pertain to future entrepreneur’s? Is this appetite merely an appetite for skill sets that cannot be bought or copied like software can be, and because of this, perhaps once those skill sets are learned well enough then there will no longer be need for all of the foreign involvement? Should Hollywood be more wary about its involvement in China, especially if it might be effectively digging its own grave? I understand that it would be ridiculous to sit on the sidelines, but might it be just as ridiculous and reckless to rush into this market without considering how that will effect the long-term future first? I don’t get the sense that the Chinese government and officials want Hollywood’s involvement, actually I feel as though their legislation and actions (often inaction – IPR), often illustrate the contrary, and that is where policy and therefore – ability, stem from in China. Do you think that Hollywood has much of a chance in this? Cause its reputation works for it as much as against it. Nicholas, you ask a good question. Like anyone else, Chinese producers will pay for what they need, and not for what they don’t. Yes, there is a bias toward hiring locally when the needed talent is available, but that’s true everywhere. And yes, China’s professionals are learning their trades partly by working with skilled foreigners. If you teach someone a skill does that mean they’re obligated to keep you on the payroll for good? No one is going to make a long-term commitment to someone–whether they’re a foreigner or not–when they’ve gotten what they need from them. Can’t see my first comment I posted from the other day here any more. It was about China and it’s rules being over stringent and how they have boxed themselves in due to the content they deliver. It’s good for China audiences but just does not go down well for foreign. It’s to Chinese. Flowers of War, looks great but won’t make any money for the investors due to the above. Myself, I’m going to look at the free and easy Hong Kong for shooting even though I live in Beijing. Whoops, there it is now. Must be my slow computer. This is an interesting article and the replies are also interesting. There is an inherent assumption that making domestic films for the domestic market is not a reasonable ambition in the film industry. However, if the domestic market is the size of China (or the market absent from this article, India) why should they change their product to try to attract the global market place? A student of mine did a nice little study this year where she looked at audience responses to films that were co-produced and the responses of Chinese and non Chinese audiences. What was clear was that these audiences wanted very different things from ‘Chinese film’. So, why chase the international audiences when the domestic market is thriving? Why dilute culturally specific stories for the sake of the global entertainment industry? Why liberalise the film industry in China when under the GATT negotiations we saw that a good case can be made for the need to protect these industries? Also, the implication that Hollywood has dominated the global box office due to their prowess in development, production and distribution belies the aggressive industrial polices that the US film industry through the MPAA have enforced since the 1920s. Film was exported around the world in order to ‘teach the world how to be American’ as Will Hays proclaimed it would. The US has continued to lobby for liberalisation for those coming late to the industrial policy game including the aggressive negotiations during the Uruguay round of GATT and when they forced Korea to reduce its 40% quota in the face of a trade freeze. The film industry is a delicate balance of telling culturally specific stories, educating and entertaining and managing a complex international trade environment. Hollywood understands Hollywood, but as we have seen in the last few years, Hollywood may have lost its way as budgets increase and it gets more and more difficult to find mid market films, films for audiences other than children or young men? Thank you for your thoughtful contribution to the dialogue here regarding international trade in the motion picture industry. You make good points regarding the inherent opportunities in the domestic Chinese market. But, to be very clear, I have never stated or even implied that making domestic films for China is not a reasonable business pursuit. On the contrary, I myself presently have two Chinese domestic film projects in advanced stages of development, including one that will shoot in Mandarin. But domestic opportunity and international opportunity are not mutually exclusive, and in fact most of the Chinese producers I know are extremely motivated to find ways to make films that appeal to global audiences. 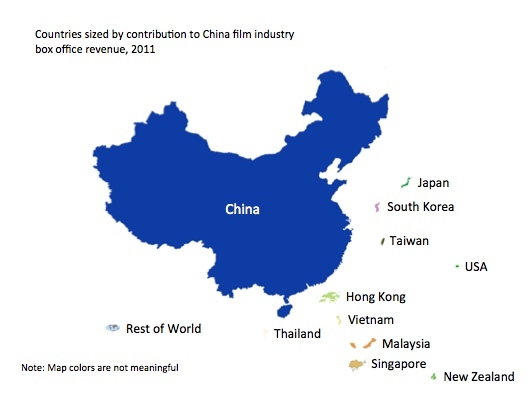 As for your suggestion that China is being unfairly forced to liberalize its film industry, I would ask you this: why should China be allowed to remain the only country among the 153 member nations of the WTO that doesn’t play by the rules on import and distribution of films? China clearly and explicitly agreed to open up its cultural markets as a condition of its entry to the WTO, but has blatantly disregarded that commitment time and again for years. You seem to want to make the case that China is a victim here, but in fact China has manipulated the system to its advantage, exploiting the good faith and trust that the WTO member countries extended when they granted China’s accession. Finally, if there seems to be a bias in Chinafilmbiz toward Hollywood and international players, that’s because most Chinese are unable to access this blog. I would very much like to count Chinese producers, financiers distributors and talent among the readership here, but the Chinese government has a policy of blocking most internet communications from outside its borders, so I have make the assumption that there are very few Chinese readers in this audience. It seems to me that all specific business opportunities aside, the Chinese are pushing for one thing – improving their own competence and confidence, which will benefit both their local industry and exploitation, and the performance of Chinese films in the global marketplace. The elements that cannot be objectively measured are the amount of culture specific content that Chinese people will reliably consume, and how much content “set in the Chinese culture” can be seamlessly exported. Big nations bring about change slowly, especially in mindsets. The Chinese reluctance to play by the rules is actually triggered by fear, I think. What can be better than allowing Hollywood talent to see how well or how badly it can fare within the Chinese film industry, as soon as possible? If the romance catches fire, then great for China. If it does not, then it was a great experiment anyway.